Use other people’s accounts to your advantage by including their Twitter handles. Retweeting from popular figures can make interesting posts. Find the tweets with higher impression statistics, and focus on repeating that format or type of tweet. 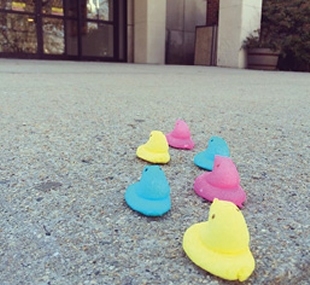 At EPPL, the Peeps have been a huge hit! 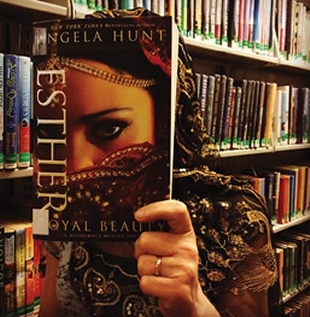 Our staff loved finding great book covers for #BookfaceFriday. With many of our patrons using Twitter, we must find ways to be effective marketers in just 140 characters. At the East Providence Public Library (EPPL) in Rhode Island, we’ve had an active Twitter account since December 2008 (@WeaverLibrary). When I arrived in March 2015 as the first digital services librarian, I was very impressed by the library’s early adoption of Twitter. I came in as an experienced tweeter from both personal and professional perspectives. The goal of having a great Twitter presence is to engage and interact with an audience. If patrons want to use Twitter as their primary news source for the library, then having a great presence allows them to do so. The most important aspects to focus on are getting the word out that you have an account, describing your services in a few words, and analyzing which tactics work best for your library. Getting the word out that you have a Twitter page can be the trick to reaching more patrons who are Twitter users and ultimately to increasing your reach. I will often post on Facebook that we have a Twitter page or vice versa. Facebook provides analytics as to how many have seen a post, which gives me a good idea of how many people we reach by promoting our Twitter page on Facebook. I am also a proponent of using social media icons on all of EPPL’s paper fliers. While there is not a formal way to measure how much this spreads the word, it can only help. I will be the first to admit that coming up with witty and inspired social media posts can be difficult. I encourage all staff members to suggest ideas and themes we can use. Since we all work in relatively close quarters, colleagues will typically suggest ideas in person or email me photos of events they’d like posted. Oftentimes, we discuss how ideas can be used, as well as the timing, if we have many posts already scheduled. Typically, I am able to work in all suggested ideas. This helps our marketing efforts because my sense of humor is different than that of my colleagues, and the items I choose to retweet for the library are not the same as what my colleagues would select. I think it’s helpful—and it increases staff buy-in—when you ask others to participate. The first task I accomplished when I took over Twitter duties at EPPL was to go on a “follow” spree. I like to follow other libraries, local schools, local organizations, museums and attractions that EPPL has passes for, local and national news networks, local and national politicians, and more. By doing this, other Twitter account owners discover through their notifications that EPPL is interested in the information they are sending out. I’ve found that following a vast array of accounts has made the Twitter part of my job a lot easier, primarily because the information I want to retweet or interact with comes to me, so I don’t spend time hunting it down. After logging in, I am usually able to find something relevant to retweet within the first 20 tweets in EPPL’s feed. Since the library is a department of the city of East Providence, I have found that working together with the city’s Twitter page is incredibly helpful to both parties. Oftentimes, I will retweet information the city posts, and its Twitter manager will do the same for us. While the library has more followers than the city does, the chances for reaching those who do not follow both pages are high. Recently, I saw a local news reporter’s tweet about having trouble using Google to search. I responded to him by tweeting a link to Google Tips and Tricks. In return, he favorited the tweet, and another local news organization retweeted it. This is where our helpfulness and willingness to provide information come in handy for PR and engagement purposes. I find it best to not just promote what you are doing within your library, but to reach out to other accounts. A “favorite” will go a little way when it comes to engagement, but a quick reply will go farther. Also, when EPPL has presenters coming in, I am sure to tweet using their Twitter handles. This gives the presenter a platform to retweet and to pass the word on to their own followers, thereby giving your organization more recognition. This worked well for EPPL when Good and Cheap author Leanne Brown came to speak. We had a great response from her Twitter page and had a higher amount of interaction with EPPL’s page. The same thing happened when EPPL had a local theater director speak. 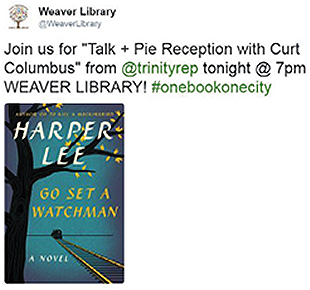 Our tweet was retweeted by the theater group, which shared the news with all of the theater’s followers that our library would be hosting the event. Another source for inspiration and engagement for the tweets I craft comes from Twitter’s Trending Topics. I keep EPPL’s Trending Topics set to U.S., since worldwide topics tend to be in other languages and are harder to engage with. I. Love. Hashtags. Why? Because they provide a way for us to reach Twitter users outside of our followers. Using Trending Topics and adding our own library spin to them is a way to help garner attention and engagement. Take the hashtag #WednesdayWisdom: I recently used it with a pro-library quote from a popular author. Hashtag overuse has become a problem with social media over the past few years. It can clutter up tweets and break up your information. I do not use hashtags in every tweet, and that has worked well for EPPL’s Twitter feed. Using a slew of hashtags can make tweets hard to read or leave room for misinterpretation. Also, I caution against “hashtag hijacking,” which is using a hashtag in a tweet that is not relevant to the hashtag itself. Barnes & Noble’s account started the hashtag #90sABook, in which tweeters combine book titles with 1990s-related icons (think “Game Boy of Thrones” or “The Diving Bell and the Butterfly Clips”). I clicked the hashtag to see what others had tweeted, and, unfortunately, a few spam accounts had used this hashtag along with inappropriate material that was definitely unrelated. It is important to use hashtags that accurately reflect the information you want to pass along. I am using social media about 80% of the time while I am working. Truth be told, I do not always look at the sites, but they are running in the background of what I am doing. Keeping Twitter open most of the time at work gives me a way to quickly look at what the Trending Topics are and quickly come up with a post to reflect them. Limiting your info to 140 characters can be tricky. When traditionally advertising events on paper, in a slide presentation, or on another social media platform, I provide the who, what, when, where, why, and (sometimes) how information. For Twitter, I limit my posts to the what, when, and where, then add the URL. Location is important, since EPPL has a main library and a branch. Each library that uses Twitter must decide on the frequency of its posts, because no two groups of patrons are exactly the same. I often search for articles on tweeting frequency to see if new research has come to light about this special balance. I found an article from Adweek’s SocialTimes website (www.adweek.com/socialtimes/social-media-post-frequency/615992) that says interest declines after an account’s third tweet. I try not to publish more than three original tweets per day because I do not want to overwhelm our followers. If I have decided to live tweet an event and have publicized my plan, then I’m fine with breaking my frequency rules. Since live tweeting is interactive, I want more immediate engagement from my followers. EPPL recently held an event in which 21 Rhode Islanders read from Maya Angelou’s works. I posted a photo of the flier to let followers know that the event was happening at that moment, then proceeded to post more photos with captions. I find it helpful to advertise a few times before the event that I will be live tweeting it so followers can tune in. Since Twitter is open 24/7, I try to engage followers in that manner. Scheduling tweets for times that I am not at the library helps in gaining reach and also appeals to all types of Twitter users: early risers, midmorning work-break users, nighttime skimmers, and so on. This allows EPPL’s tweets to reach those who may not be using Twitter when the library is actually open. Scheduling tools make that possible. In fact, Writtent recently compiled a list of them at http://writtent.com/blog/best-twitter-scheduling-tools. (I think Hootsuite and TweetDeck are the easiest to work with.) I don’t use a formal plan or calendar; instead I use our scheduled Facebook posts as a guide. All of our staff members schedule posts to Facebook, and I take the photos and info from those posts and translate them to Twitter. Now you may ask, “Well, how do you know what’s been working?” and the answer from EPPL is that we rely on analytics and feedback from patrons. Twitter Analytics (http://analytics.twitter.com) is a wonderful, free tool that all Twitter users can tap into to see just how well (or how poorly) their tweets are doing. I look at EPPL’s Twitter Analytics page almost every day to keep up on what is working and what is not, to discern the best times of the day for tweets, and to check the engagement count. I typically pay the most attention to impressions (the number of times users saw the tweet on Twitter). The EPPL Twitter account currently averages about 232 impressions per day, and my goal is to make that number higher every month. During months when I schedule tweets via TweetDeck (tweetdeck.twitter.com), I always garner more reach and activity. I mostly schedule tweets, but will retweet in real time, which keeps our page active and relevant. There are many other Twitter statistics tools, such as SumAll, but I like to make this as easy for myself and the staff as possible and stick with the Twitter Analytics platform. Last year, Twitter published an article on its blog about deciphering Twitter Analytics (https://blog.twitter.com/2015/5-things-you-might-not-know-about-twitter-analytics). I started to take note of what our audience members’ interests are so I can appeal to these categories with tweets. Demographic information is also available, which can help all librarians see whom they are posting to. Another resource the platform offers is Twitter Ads, which are paid promotions. EPPL has decided not to use them for a few reasons, the main one being the budget. The funds EPPL would use for Twitter Ads could be much better spent on other resources. A second reason is that as a personal Twitter user, I typically dismiss all ads. I am following whom I want to follow for a reason and find that Twitter’s algorithm does not adequately match the paid-for tweets to potential followers very well. I find that the “Who to Follow” suggestions and hashtags are more helpful in locating accounts or information that I want to engage with. I think it is odd when I get a pop-up tweet for an account that has no relevance or relation to my or the library’s interests. While promoting books and media on Twitter is one way to reach followers, I also like providing information outside of that realm. For example, on St. Patrick’s Day, instead of promoting green books, I decided to tweet about the history behind the holiday. Showing that EPPL is not “just about the books” reflects the library’s ever-changing way of providing information and gives a bit more personality to the Twitter page. I love to craft posts featuring our staff and get great feedback from those. One of the most popular types of tweets with employees were those tagged “#BookfaceFriday.” We also get great feedback when I post photos from events. Last summer, I had great reach using photos from our weekly farmers’ market and our outdoor summer concert series. “Keep it positive” is my motto for tweeting from the EPPL account. Social posts are a reflection of EPPL, so highlighting fun, helpful, upbeat, and smile-worthy information is important. Also, if someone tweets at us, I don’t ignore it. Even a simple “thanks” creates an interaction that can help increase your reach. Twitter gives EPPL access to 320 million active users and allows the library to reach and engage followers on one of the world’s most popular social media sites. Catherine Damiani is the digital services librarian at East Providence (R.I.) Public Library. She holds an M.L.I.S. from the University of Rhode Island in Kingston. Damiani is a 2016 ALA Emerging Leader and runs workshops for librarians on how they can use Twitter to their professional and personal advantage. Her email address is cdamiani@eplib.org, and her Twitter name is @BiblioCatherine.